uses is being restricted by Government order. ventories are necessary to efficient working conditions. pounds. The 1941 consumption was by far the largest in 24 years of record. agricultural commodities in the Emergrency Price Control Act. Sales of domestic wool at Boston were relatively small in January. mums before taking.on additional supplies. wool situation was largely dominated by .the defense program. tion as a strategic "stockpile". the highest levels since 1928-29.
wool consumption and to the fixing of maximumprices for wool and wool tops. 8 to 10 cents a pound higher than a year earlier. higher than at any time since 1928.
in December used the period October 1-December 6 as a base period. $1.279 for wool top and 95.8 cents for grease wool. ment in 1941 as a strategic stockpile are not included. quarters 1937-41, are shown in table 4. Compiled from Bureau of the Census Quarterly Wool Stock Report DAcembfr 31.
and an average of about 575 million pounds in the 5 years 1935-39. 81 percent of the apparel wool consumed by United States mills. domestic and foreign apparel wool by United States mills. Requirements for apparel wool for Army use in 19142 will be large. Quartermaster General at the National Wool Growers Convention in Jnnuary. losses under present war-time conditions are not available. is being supplemented by imports. included about 275 million pounds from South America. conditions will be strengthening factors-in domestie-wool prices in 1942. Prices for most domestic wools are.now-at-the-highest level since 1928-29. 1919 to June 30, 1929. Compiled from reports of the Agricultural Marketing Service. Compiled from reports of the Bureau of the Census. 2/ Derived from yearly totals will not equal average of monthly averages. 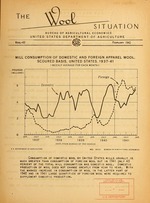 Compiled from wool consumption reports of the Bureau of the Census. mating calendar years except 1938 which covers 53 weeks. I: Year : Dec. : Nov. : Dec.
dition received from pulleries and is mostly washed. :1,000 lb. 1,0: lb. 1,000 lb. 1,3O l.b. 1,00l b. 1,0 lb. 1,000 bb. SIncludes*carpet wool afloat to the United States. ____ 19J3 : 1940 :1941 1/: Jan. : Nov. : Dec. : Jan.
2/ Before payment of.duty, Compiled from the'Boston Commercial Bulletin. Domestic yarn, first quality, Bureau of Labor Statistics. F .o.b. producing plants, Bureau of Labor Statistics. or transfers on and after Jan. 29, 1942.
than the applicable maximum price. 5 cents less than the applicable maximum price. accordance with sub-paragraphs 1 and 2 above. divided with the seller or with an agent or employee nf the seller. (Executive orders Nos. 8734, 8875, 6 F. R. 1917, 4483).